Plant Description Arbequina Olive Trees are evergreens. 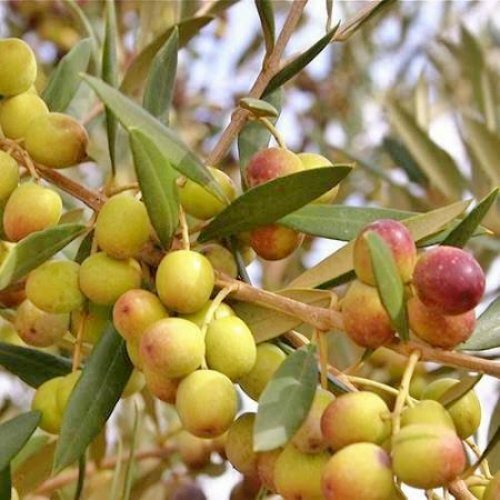 They are also prolific producers and can grow up to 20 pounds of Olives per year when properly maintained. The fruit they produce are highly aromatic, small, dark brown and very flavorful. They can be used as a table olive but are also known for their high oil content, making them an ideal fruit for olive oil production. They are very adaptable and can be grown in all areas of the United States. We recommend them as patio or indoor plants for zones 4-11 and they can also be grown as outdoor trees for zones 8B-11. Arbequina Olive Trees thrive in warm temperatures but can tolerate some cold. It is preferable to keep the trees in temperatures above 50 degrees so they do not drop their leaves or fruit. Arbequina Olives are the most popular of All Olive Trees. These evergreen trees are self fruitful and produce abundantly. Our Olive trees are grown from proven fruiting wood and are at fruit bearing age. They blossom in the Spring and the fruit will ripen to a smaller, dark fruit in the later part of Summer. The Oil from the seeds is also of the highest quality. These trees can be planted in the ground in zones 8B-10 and are cold tolerant to 22 degrees. When planted in the ground they can reach heights up to 20 feet and they will need 12 feet of spacing. You can grow them in a container in ALL zones. When container grown they will reach a height of about 5-6 feet tall. How to Grow Most all edible plants grow well in Full Sun but a little shade won't hurt. Olive Trees can be planted in most healthy soils in normal pH range. I recommend when you receive your plants to grow in a 4 inch to 1 gallon pot in a good organic potting soil like Fox Farm's Happy Frog. This type of potting soil has natural soil microbes and beneficials along with fertilizer already mix in. After your Kiwi Plants are a little more establish plant in a rich soil mix with similar beneficials and fertilizers. The price includes Four (4) "Arbequina" Olive (Black) Trees with USPS Shipping. These are 2 inch rooted starter plants shipped in tray pots and are 4-7 inches tall. Pictures are accurate of the plants you will receive. Arbequina Olive Trees are evergreens. They are also prolific producers and can grow up to 20 pounds of Olives per year when properly maintained. The fruit they produce are highly aromatic, small, dark brown and very flavorful. They can be used as a table olive but are also known for their high oil content, making them an ideal fruit for olive oil production. Most all edible plants grow well in Full Sun but a little shade won't hurt. Olive Trees can be planted in most healthy soils in normal pH range. I recommend when you receive your plants to grow in a 4 inch to 1 gallon pot in a good organic potting soil like Fox Farm's Happy Frog. Please take your time and read full product description and recommended growing guidelines under Product Description.